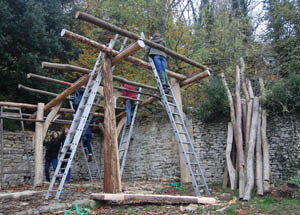 I am working with Waldorf College students to build their outdoor classroom three days a week. 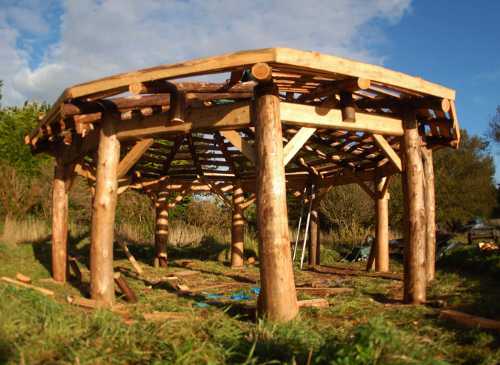 We harvesting timber from the adjacent woodland to build this round wood timber frame which stands higher than the original cow byre, which would only have been high enough to house livestock. The budget here has been very tight so we have re-used old materials where possible and what local timber we have been able to harvest. 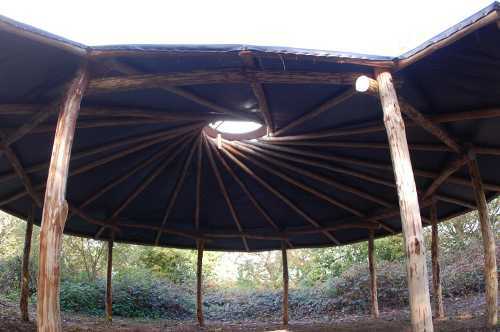 This has of course meant that we have used species that I would never usually recommend for outdoor structures. However like pioneers we have used the materials available to us as best as possible. Successive years students will add to the structure completing one bay per year and after it is finished students on subsequent courses will be involved in it’s maintenance and repairs. Using some ‘perishable’ timbers brings opportunities if the building can be considered a learning opportunity rather than a finished product. 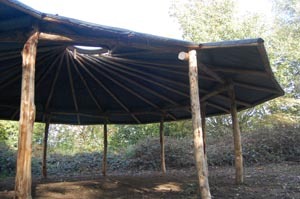 Other than providing shelter the greatest benefit the structure offers is for the involvement of the students learning to build it. It follows therefore that it’s limited life span offers repeated opportunity for future students to get involved in maintenance and re-building. Quite a topsy turvy approach to building! 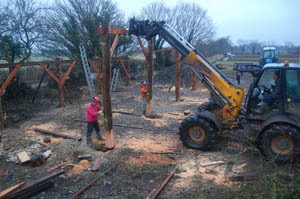 We will be adding another bay on the pole barn at our woodyard this year. 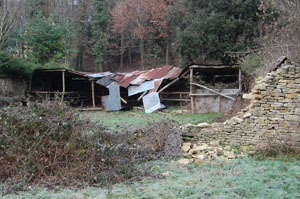 This is our main work/teaching site on Duchy Home Farm. This build is a little un-usual for us as it is designed by an architect with very little input from us and so it not exactly what we would choose to build. However it is from local larch and is keeping us warm and dry which we love! It has also been attracting the local larch wasps one of which tried to lay eggs in Brian’s foot!